The standard black T1291 cartridge is listed as printing 380 pages. You do packs of genuine Epson cartridges with much more capacity. Is the black available separately? I do very little colour work. Thanks. Will the T1301 black ink cartridge definitely fit the Epson Stylus Office BX630FW printer as looking on the photograph of the box on your website there's no reference to that printer? Will these cartridges really work in my BX630FW printer? I've bought compatIble ones in the past and the printer would not accept them. Provided that your Epson Stylus Office BX630FW printer was purchased in the UK and the cartridges you order have the correct codes you should be able to use them without any problems. Our compatible Epson BX630FW ink cartridges are very reliable and have the correct chip attached to the cartridge so they should be recognised by your printer once they are installed. If you do encounter any problems using our compatible Epson Stylus Office BX630FW cartridges we have a 30 day money back guarantee so you can return them to us for a refund. If you're considering purchasing an inkjet printer, for small business or office use, then the Epson Stylus Office BX630FW is ideal. The multi-functional printer can scan, print, copy and fax at lightening speeds. The all-in-one Epson Stylus Office BX630FW is a black, modern printer that has a lot of useful features that make printing hassle free. The 6.3cm LCD screen and functional buttons on the front panel are easy to use, allowing you to quickly operate the printer without using your PC. Also on the front of the printer is a memory card slot and a USB port so that documents can be instantly uploaded to the printer. If you are lacking space, this printer may not appeal to you, as it is quite large (W446 x D360 x H226mm). The Epson Stylus Office BX630FW exceeds in quality with a print dpi resolution of 5760 x 1440 and a scanning output of 2400 x 2400. The BX630FW has a fairly quick speed of 15ppm mono, unfortunately colour prints drops to 7.1ppm. The printer does come with Ethernet and WiFi connectivity – perfect if you want to attach multiple devices. Another bonus is that the BX630FW is economical; the built in duplexer allows you to print double sided with ease. 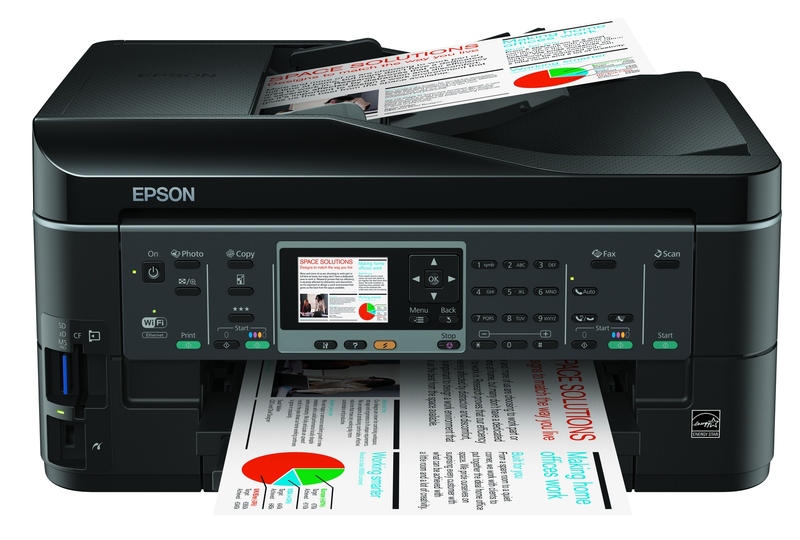 If you are after a printer for your home, then you may be concerned about the size and weight (8kg without ink cartridges) of the Epson Stylus Office BX630FW, as it isn't very practical. Slow colour print speed may also disappoint those who wish to print graphic documents on a regular basis.